The old saying is that money makes the world go round, but in this day and age they should say debt makes the world go round. With the world having fully moved away from the gold standard and onto to the fiat money system, debt levels have predictably and drastically increased. You may have heard the figure that the total US national debt currently stands at $19.9 trillion, up from $10.7 trillion 8 years ago (if you want to see figures in real time, check out the US Debt Clock). And that’s just the government debt, if you included the debt of all sectors, the figure stands at over $60 trillion. But what about the rest of the world? Is America the only country saddled with massive amounts of debt? Could it be that America is an anomaly and that other countries are actually scaling down their debt? The answer is a definite no. The debt bubble is not a national issue; it’s a global one. According to the International Institute of Finance, total global debt levels (household, government, and corporate) have reached $215 trillion in 2016, an increase of $70 trillion over the last 10 years. Interestingly enough, this figure represents 325% that of global GDP, which is very similar to America’s total debt to GDP ratio. So it looks like the world is keeping pace with our debt accumulation; another thing to note is that America’s total debt makes up almost a third of global debt! And while emerging markets only made up $55 trillion of the $215 trillion total debt pile, or 26.8% of the total, it is the rapid pace of its growth that is sounding the alarm bells. 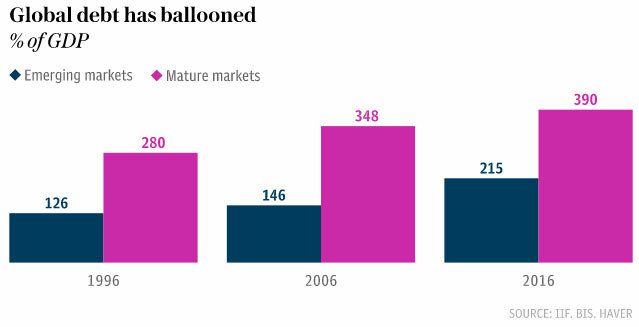 10 years ago, total emerging market debt was only $16 trillion, meaning that it has grown by almost 3.5 times in that period! Despite all that debt, growth figures are disappointing. In 2016, US GDP growth was a tepid 1.6%, compared to 2.6% in 2015. President Trump announced that our national debt had fallen by $12 billion since the inauguration, which is true but ultimately trivial. First, that figure was less than 0.005% of our national debt. Second, it was the result of normal economic fluctuations. And with economic growth still in the doldrums, governments are still continuing to use debt in an attempt to pump life back into the economy. Japan has just passed a record high budget. China’s corporate debt alone stands at 170% of its GDP. That’s over $18 trillion by the way. What does all this debt mean for us? Let’s examine the implications. The first implication is that the global economy is more vulnerable. 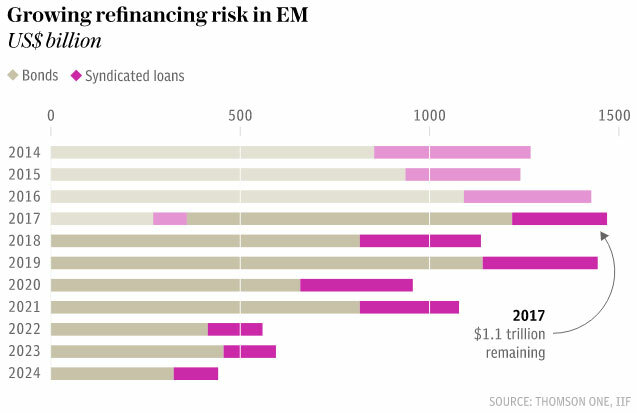 Debt has to be repaid after all, and the refinancing risk, particularly for the emerging market economies, is increasingly high. $1.1 trillion of emerging market bonds and loans will mature in 2017, 20% of which are dollar denominated. Of course, the standard practice has been ‘refinancing’, which is why the debt pile grows ever higher, but how long can this be maintained? The second implication is that because it looks like the debt intends to be refinanced or rolled-over for as long as possible, rising interest rates could be fatal. We may never return to pre-recession interest rates levels for this reason alone. The third implication is that there may be only one way to effectively pay off these debts. That way is massive currency devaluation, which will be a painful solution indeed for the citizenry. If there is indeed massive currency devaluation, investors need to be prepared. One way intelligent investors can do this is by diversifying some of their assets into precious metals. A currency can be devalued until it’s practically worthless (see present day Venezuela), but gold will never lose its value.